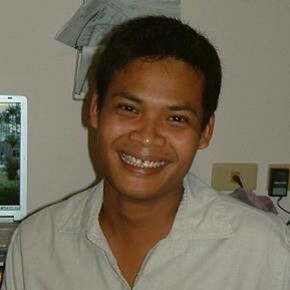 Jamlong attended Kasetsart University, Bangkok, Thailand on a four-year scholarship and graduated with a BA in Thai literature from the Faculty of Humanities in 2000. He was Vice President of the Humanities Student Club and a student representative on the Kasetsart University Student Council. After graduation, he became Associate Producer and offline editor of the award-winning independent documentary video “Mercy (“Med-dah” about children affected by HIV/AIDS in a Bangkok slum community. Screened in 11 international film festivals, it garnered two awards and was broadcast throughout the world. In 2002-2003 Jamlong received a grant from the Canadian Fund of the Embassy in Bangkok for the Mobile AIDS Awareness Tour, Thailand, presenting “Mercy (med-dah)” at more than 80 screenings including: special presentations for World AIDS Day, sponsored by UNAIDS; regional workshops sponsored by UNESCO, UNDP and SPAFA, universities, high schools, NGOs and grassroots community organizations working on HIV/AIDS education. He wrote and delivered a presentation prior to each screening sharing his personal experience with the impact of HIV/AIDS on his family. The Mobile AIDS Awareness tour was highlighted as a model project under the Canada Fund. In 2003, he joined AsiaWorks Television Ltd where he is still employed. Jamlong conducts pre-production research, is a field producer and interviewer. He is also one of a two-man Betacam SP crew for various international broadcast clients in Thailand and ASEAN nations. Jamlong continues to be active in AIDS awareness. Notably, he attended and reported on the 2006 World AIDS Conference in Toronto, Canada, interviewing world experts, AIDS hospice workers and NGO delegates. As A Sauvé Scholar, Jamlong took courses in Political Science (South Asia), Israel and the Middle East Conflict, International Relations (Post Cold War), participated in seminars with eminent journalists, political figures and innovators in business, academia and the arts, and trained in video production.